Over the years I have learned to look for the tiny signs, the details that may lead me to a moment of grace, a moment of quiet rejoicing, in finding that I am truly not alone in this world. I want you to think of a time where life was painful or you felt alone or you needed comfort and someone showed up, or you received a phone call you needed to hear or a special song played on the radio just for you. I want you to think about the smallest threads that have held you together when you felt like things were unraveling around you. 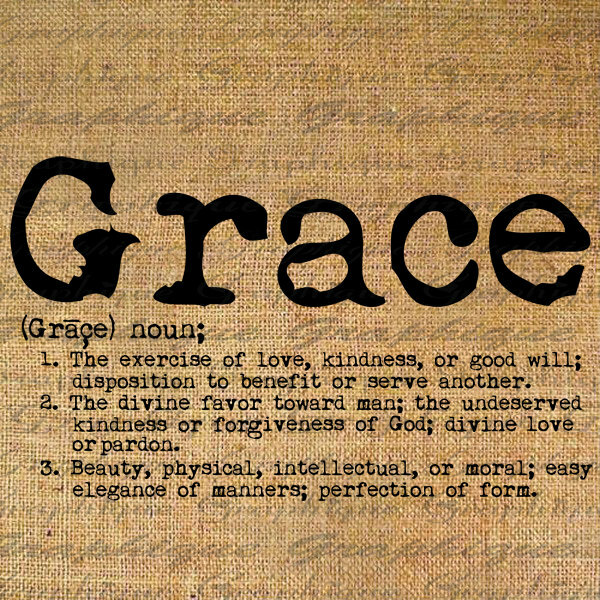 It is through these moments that we can find that quiet place of grace. I have been very blessed with little moments when I need them most. It’s as if at my lowest points there is a glimpse or shimmer of something bigger than me. When I need an answer more than ever, I am handed a gracious gift. They may seem small and insignificant to you, but to me they are cherished jewels that I can string together and hold on to. Just the other day I had been thinking and praying to know what is going to happen with my husbands professional career…would he find a job, will he be able to handle the pressure, will we have to move? I had been feeling very anxious, needing to know what lies ahead, wondering if we will have to move again, concerned about how my daughter Kate will handle such change…on and on the worries played. Then, that night while we tucked our daughter into bed we were debating if we should listen to music, read a story, etc. I lifted up our little children’s devotion book and my daughter grabbed it out of my hands and started flipping through the pages. She said, “lets do the day of my birthday.” We had practically missed almost every day in February, so I was fine going back to her special day. We began to read and I instantly knew the message was for me, for all of us. It read…THE FUTURE IS MY SECRET…Sometimes you think it might be nice to know the future, what to expect, how things will turn out. There are even some people who claim they can tell you the future. But the future is a secret. It is my secret. When you try to figure out the future you are reaching for something that is Mine. My keeping your future a secret, I am teaching you to depend on Me. Trust My promises to care for you, to look out for you. I will show you the next step you need to take, and the one after that, and the one after that–one step at a time. Don’t try to rush ahead of Me. Just relax and enjoy the journey to your future–one day at a time. Another moment was a time when my husband was leaving town on a business trip. He had been really stressed with work, had not had time to physically work out and things were really getting to him. I was worried, really worried about where he was in his mind. He had been very emotional. I stood in our driveway with our little girl and we watched him drive away. I had this terrible feeling come over me and I was filled with more worry and concern. I felt like we may never see him again, that something was going to happen. I grabbed my daughter’s hand and told her we needed to say a prayer for Daddy. She asked me why and I told her I was a little worried for Dad and that we needed to pray for him to be safe. We said a prayer and I still felt a little unsettled. I saw Louise Hay’s affirmation cards and I grabbed one from the stack, it read, “I move through life knowing that I am safe—Divinely protected and guided.” A wave of calm ran through my body and peace filled me and I knew he would be okay. One last moment I will share was this last summer when my little family was deciding if we should make a special trip to the Oregon coast. I have wanted to go visit the Redwood Forest for years and my husbands job was constantly taking him to Washington and Oregon, so we were thinking this would be a good time to go. I began planning, looking at costs, trying to figure out if it would be good timing when my daughter ended up in the hospital a few months before with Pneumonia. Thankfully she was there only a couple days and got better, but then the medical bills came, our car had some issues and the Redwood trip looked like it should be pushed back to another year. The day we had decided the timing was not right I had a couple of moments of grace…that same day I was looking through my book collection for a book to include in a teacher appreciation basket. I came across a book called “The Woman’s book of Confidence.” I began to flip through the pages to make sure there were not any notes or markings when I came across a page titled, “Deep Roots.” I was curious and began to read, it was all about this women’s trip along the coast and the Redwood forest. I knew this was a sign. I immediately called my husband and told him we needed to go. Later that same day I took a walk through the forest near my home. I was smiling to myself thinking about the amazing coincidence that had just occurred when a voice in my head said, “it’s about time you got it!! I have been trying to tell you, I even had you move to Redwood Drive.” I laughed out loud at this funny moment. There was definitely inspiration about!! It is a good thing we took the adventure to the coast because now my husband will not be traveling to Oregon or Washington again. Thank heavens for that amazing trip. I am glad we listened. Well, inspiration, grace, whispers, feelings, thoughts, all echo the same song…that you are not alone, so look for the little signs, pick up the books that seem to call you, fill your heart with wonder, look for the magic in all things and know you are not alone.